မြန်မြန်သွား | myan2-myan2 thwa3 means "go fast". ဖြေးဖြေးသွား | pfyay3 pfyay3 thwa3 means "go slow". In Burmese ကျယ်ကျယ် | kjeare2-kjeare2 means loudly. And the opposite of kjeare2-kjeare2 is တိုးတိုး | toe3-toe3. I am lost for word as to how to say the opposite of "loudly" in English. Is there an English adverb which means "in low volume"? "Quietly" or "Silently" means no volume at all. You can say "whisper" "hush..hush" or speak "softly", but how do I tell someone to listen to the radio in low volume using the opposite of "loudly"? By the way, the Burmese phrase is တိုးတိုးဖွင့် | toe3-toe3 pfwin1 (in low volume + to open) to tell the teenager to turn on the latest electronic gadget in low volume. CLICK TABLE HEADER COLUMNS TO SORT BY ASCENDING OR DESCENDING ORDER IN ENGLISH OR BURMESE SCRIPT. xxxx ချင်တယ် | xxxx chin2 deare2 -- I want to xxxx. သံရုံး သွားချင်တယ် | thun2-yone3 thwa3 chin2 deare2 -- I want to go to the embassy. မောင်း | moun3 -- drive! 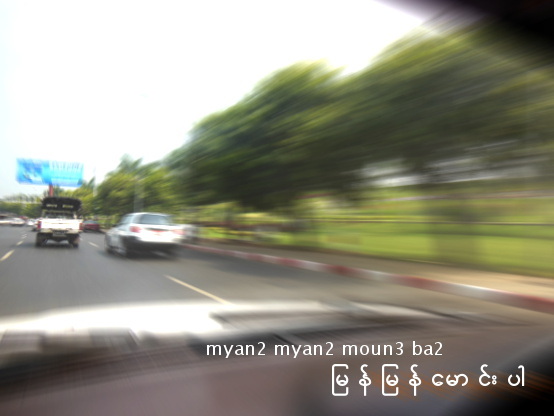 မောင်းပါ | moun3 ba2 -- Please drive! မြန်မြန်မောင်းပါ | myan2-myan2 moun3 ba2 -- Please drive fast! The Adverb in the Burmese grammar has a Pali origin, and is known as ကြိယာဝိသေသန | kri1-ya2 wi1-thay2-tha1-na1. The word ကြိယာ | kri1-ya2 refers to the action words (Verbs), and ဝိသေသန | wi1-thay2-tha1-na1 means to modify or to qualify. Burmese adverbs qualify the verbs similar to English. ရိုရိုသေသေ ကိုင်ပါ။ | yo2-yo2 thay2-thay2 kine2 ba2 - Please handle with care. နှေးနှေးကွေးကွေး | hnay3-hnay3 kway3-kway3 - sluggishly. ဝုန်းဝုန်းဒိုင်းဒိုင်း | wome3-wome3 dine3-dine3 - noisily. မိုး အကြီးအကျယ် ရွာနေတယ်။ | mo3 a-kji3-a-kjeare2 ywa2 nay2 deare2 - Rain is pouring down heavily. တဲပုတ်တွေ ဖရိုဖရဲ ဖြစ်ကုန်ပြီ | teare3-boat dway2 pfa1-yo2 pfa1-yeare3 pfyit kone2 byi2 - Huts are in disarray. အခုသွား | a-khu1 thwa3 -- Go now! အခုသွားတော့မယ်။ | a-khu1 thwa3 dau1 meare2 - I am about to go now. ခဏနေ စားကြမယ်။ | kha1-nah1 nay2 sa3 ja1 meare2 - We shall eat in a while. ဘယ်လိုသွားမလဲ | beare2-lo2 thwa3 ma1 leare3 -- How will you go? ဘယ်တော့သွားမလဲ | beare2-dau1 thwa3 ma1 leare3 -- When will you go? လုံးဝ သဘောမတူဘူး။ | lone3-wah1 tha1-bau3-ma1-tu2 bu3 - I absolutely disagree. အနည်းငယ်သာထည့်။ | a-neare3-ngeare2 dtha2 hteare1 - Just put a little. The song in the video clip below used the adverb တစ်ကြိမ်တစ်ခါ | da1-jain2-ta1-kha2 meaning once in a while. သော | dthau3 -- (particle) convert the clause into adjective to mean "rare"
တစ်ကြိမ်တစ်ခါသာ ရသောပွဲတော် အတူတူပျော် | da1-jain2-ta1-kha2 dtha2 yah1 dthau3 pweare3-dau2 a-tu2-tu2 pyau2 -- We have this festival only once in a while. Let's be happy together. You will note that many of those Burmese adverbs are formed by doubling of words. For example, koun3 means ကောင်း | good (adjective), and ကောင်းကောင်း | koun3-koun3 means nicely (adverb), or in a good manner. Those double-word adverbs are frequently used in spoken form and they are further classified as နှစ်ကြိမ်ထပ်ကြိယာဝိသေသန | hna1-kjain2-htut kri1-ya2- wi1-thay2-tha1-na1 in Burmese grammar, which means "two-times-repeat adverbs". သိပ်ကူချင်တာပဲ | thate ku2 chin2 ta2 beare3 - -- I want to help so much. နေ | nay2 -- particle equivalent to present participle "ing"
လူတွေ အရမ်းတိုး နေကြတယ် | lu2-dway2 a-yan3 toe3 nay2 ja1 deare2 -- There's too much shoving and pushing going on. In Burmese, the word သောက် | thout (to drink) is used for "taking" medicine in both liquid and tablet forms. မနက်တိုင်း အလုပ် စေါစေါသွားတယ် | ma1-net tine3 a-loat sau3-sau3 thwa3 deare2- - [he, she, I] go(es) to work early every morning. ဘတ်(စ်)ကား အကြာကြီး စောင့်နေရတယ် | but-sa1-ka3 a-kja2-ji3 soun1 nay2-yah1 deare2 -- I had to wait for the bus for a long time. အချန်သိပ် မဖြုန်းပါနဲ့ | a-chain2 thate ma1 pfyone3 ba2 neare1 -- Don't waste too much time! This word is interesting. မကြာခဏ | ma1-kja2 kha1-nah1 is a coined word using မကြာ | ma1-kja2, which means not + take a long time, and ခဏခဏ | kha1-nah1 kha1-nah1, which means again and again. So, မကြာခဏ | ma1-kja2 kha1-nah1 means you do something again and again before a long time. The appropriate English translation is every now and then. အိမ် ချောချောမွန်မွန် ပြန်ရောက်လာပြီ | ain2 chau3-chau3 moon2 moon2 pyan2-yout-la2 byi2 -- [ He, she, I] has/have come back home safely! ဖိနပ်ကို ဒီမှာ သပ်သပ်ရပ်ရပ် ချွတ်ပါ | pfa1-nut go2 de2 hma2 thut-thut-yut-yut choot ba2 -- Please remove your shoes neatly here. ဟင်းတွေ ဖြစ်ကတတ်ဆန်း မချက်ပါနဲ့ | hin3 dway2 pfyit-ga1-dut-hsun3 ma1 chet ba2 neare1 -- Please don't anyhow cook the dishes. ပန်းကန် စင်အောင် သေသေချာချာ ဆေး | ba1-gun2 sin2 oun2 thay2-thay2-cha2-cha2 hsay3 -- Thoroughly wash the dishes in order to be clean. မလဲ | ma1 leare3 -- ending question word. ရေလုံအောင် ဘယ်လိုပိတ်မလဲ | yay2 lone2 oun2 beare2-lo2 pate ma1 leare3 -- How do I shut the faucet tight so that water will not be dripping? The word အောင် | oun2 is a positive word which means "to pass", such as in "to pass the exam" (verb). It can be appended to several other words as conjunction to mean "in order to make it happen". For example, စင်အောင် | sin2 oun2 means "in order to make it clean", where စင် | sin2 means "be spotlessly clean". 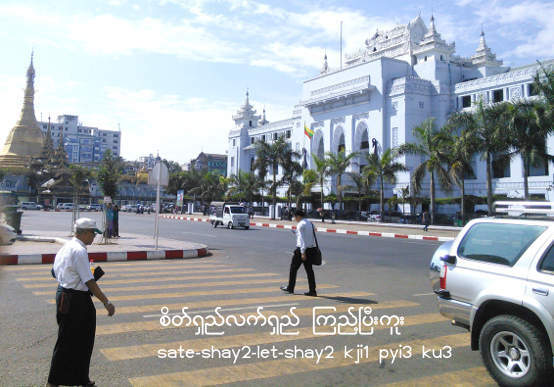 ရေဒီယို အကျယ်ကြီး နားထောင် | yay2-di2-yo2 a-kjeare2 ji3 na3-htoun2 -- listen to the radio so loudly. အပတ်တိုင်း မှန်မှန် ဈေးဝယ်တယ် | a-pup-tine3 hmun2-hmun2 zay3 weare2 deare2 -- I shop regularly every week.